I was introduced to Mel Frank as “The Godfather of Growing Marijuana.” It was 2014 and I was visiting a vape company he was consulting. Frank knows the nuances of the pot plant very well, making him a sought after expert for burgeoning companies looking to optimize their methods of cultivation and extraction, among other things. 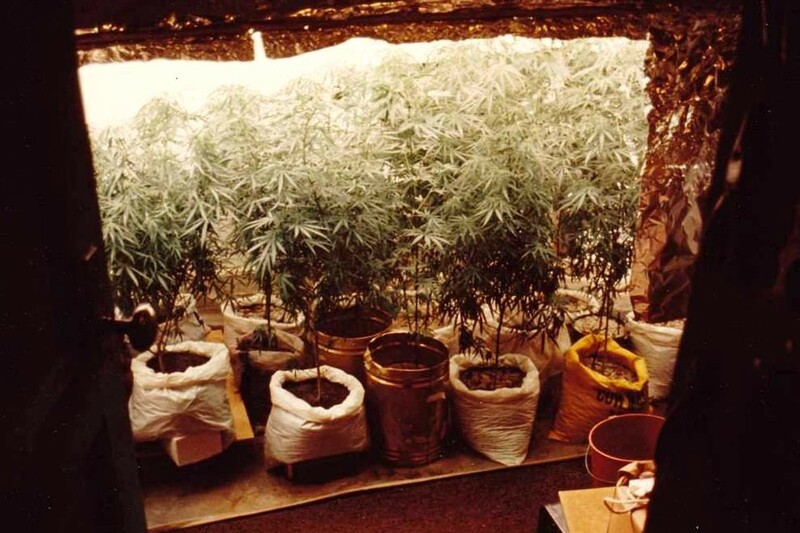 Cultivation is what earned him his nickname, as he was a major player in the proliferation of information about marijuana horticulture, as well as actual weed seeds, in the U.S. over the last few decades. These days, Frank makes his home in California, where weed is now legal and where he hasn’t lost his zest for growing. While perched on his sun-drenched patio in the hills of East L.A., he admires one little weed plant he’s cultivating in the garden beneath us. The air smells sweet like flowers, but not weed flowers, and butterflies flutter around as Frank tells me about his upcoming photo exhibit at the local M+B art gallery, in which he will show selections from his extensive marijuana photography collection. As a longtime weed scholar and scientist, Frank has always documented his process through photos, providing his own art, including microscopic photographs, for his books. Over the next hour, we talk about why he distributed his weed seeds for free; the rare international seeds he collected in the 70s and 80s; and the recent history of weed as he sees it — from full-on prohibition to medical programs to the current era of adult-use (in some states at least). Walk me through the origins of your relationship to weed. How did you start growing? In 1967, I finished up four years of service in the Navy. I was an electronics technician fixing electronic communications equipment. After returning home to Boston and spending a couple months with my mom, I got an apartment in New York City and smoked my first joint there during the holiday season. Back then, you got a ton of seeds when you bought grass. One of the first things I purchased was a little over an ounce of Mexican, which had one or two thousand seeds, and I started growing them. I had a seven-room apartment on the Upper West Side for $125 a month and grew a lot of plants in it. There was great eastern light, and I was already growing other plants, so it was natural to start growing marijuana. By 1968, I had a room set up with four fluorescent lights I began growing under. That progressed into using professional lights, and I began experimenting with different sized pots, seeds and fertilizers. As I started growing, I was also working at the phone company. I quit that job in the spring of 1970 and bounced around from there, renting out summer shares at a house in Montauk with my girlfriend, working on film crews and other various things. But I needed money for rent between jobs, and my friend, who was a very good journalist, suggested I write an article that he could help me sell. I told him I wasn’t a writer and that I didn’t have anything to write about, but he told me to pick whatever I knew about and start there. And what I knew about was how to grow marijuana in a New York City apartment. So I wrote that article, and we published it as a two-part series in Rolling Stone. After it ran, the publisher told me a couple of different things: One was that Rolling Stone got more requests for reprints on that story than anything else they’d ever published. The other was that he thought I should meet Ed Rosenthal, a guy who was going around selling these little marijuana growing kits. And he became your co-author, right? Within five minutes of meeting Ed Rosenthal, he told me we should write a book together. I wasn’t so sure. But he’s a very persistent man, and over the course of about a year, he talked me into it. We took my two-part story, fleshed it out a bit and set out to find a publisher. We ended up with Level Press in San Francisco, making 17 and a half cents on each book, which was about 94 pages long and was priced at $3.50. By the time the book was published, I was already enrolled at City College in New York. I took all the biology I could and got my Bachelor of Science. Through my studies, I was determined to write a really good book about marijuana, something that went beyond those 94 pages. I began researching everywhere — Ed, too, sometimes. We’d go to libraries, especially botanical libraries, and take pocketfuls of nickels so we could use the photocopier. We’d use the Dewey Decimal System and search for keywords like THC, cannabinoids, hemp and cannabis. At the same time, in the late 1960s, the government became quite concerned with marijuana and set up a program at the University of Mississippi in Oxford, under Carlton Turner, who later became Reagan’s drug czar. That’s still the source of the government’s marijuana today. I went down to the program twice to check out their grow in 1975 or 1976. I thought I was going to meet my mentors, but after talking to them for 15 minutes, I could tell I knew more about growing marijuana than they did. Pharmacology and chemistry? Sure, they knew more. But growing good pot? I think I knew more. Where then did you get your Phd in pot? I graduated from school in 1975 and moved to California that spring. I’d been to California once before, earlier that year, and began visiting growers around the state, mostly east of San Francisco. I also distilled my new research into different chapters and wrote the Marijuana Grower’s Guide Deluxe at night. I took all the photos in that book. I bought myself a microscope and took photo-microscopic pictures of the plants, too. That book got a very good review in the New York Times, which was quite a surprise. I think they were surprised to see what the book was — that it had almost 300 scholarly references in it and color photography throughout. Did your life change after its success? Yeah, people started to find us. Ed and I bought a house in Oakland and converted a large second building into a big grow. I would freely trade seeds with visitors and managed to collect what would be called landraces today — 200 landraces from all over the world to be exact. I grew whatever I thought might be interesting and did a lot of breeding, especially hybridizing at the time. I had seeds from Colombia, Mexico, Afghanistan, China, Tibet, Cambodia and India. The funny thing is, I wish I had them all again. Now you can’t get them in the same way, and I’m dying to get so many landraces again. I was particularly looking for short-season plants, or plants that would mature before the frosts started in the East, which was a big problem with plants coming from Mexico and Colombia that couldn’t mature before they were killed by the weather. I developed some short-season varieties, like Durban Poison, which is still around today. Another was Afghani One, with seeds I got from Kabul that I didn’t have to do much with to get to grow well. Each year, I’d select the most potent plant to continue growing. Were you interested in botany growing up? I’m curious if you consider yourself a natural gardener. As a little kid, I was always planting seeds, especially flower seeds. On Mother’s Day, I’d always buy my mother a plant. But beyond that, I just always really liked plants. Your writing has taught so many people how to grow weed, but what resources were you turning to when you first started out? It was hard to find stuff written about marijuana. I found Bill Drake’s book about cultivating in 1974 in a window in the East Village and bought it. Otherwise, I’d get papers from libraries noting how to grow. I had the Department of Agriculture’s thing on growing hemp from 1893, and another from 1913. That’s what we were dealing with, so I learned a lot myself from trying stuff while growing. I learned the potency of leaves increase from the bottom of the plant to the top, and that smaller leaves were much more potent than larger leaves. At the time, pot had two or three percent THC, maybe six percent at the absolute most. So I’d always ask everybody who was buying pot to save me seeds only from the most potent plant and I’d grow those. Yeah, potency was about it. That’s changed now because it’s all potent, you know? It’s not really an issue. So now growers look at what the concentration is on the terpenes — you know, the flavor and the taste — and what those can contribute to the high. There are so many factors that go into what makes a potent plant — genetically combining and isolating these different gene combinations that we’ve done by smoke-testing for all these years. But that’s going to become quite sophisticated and refined, as will the ways we ingest it. As prohibition ends, the medical value is going to be absolutely enormous, too. I mean, if this plant had been discovered five years ago, from the Amazon jungle or something, the government would be toting it as the greatest botanical discovery ever. How do you like to ingest your weed these days? I smoke joints now. I’ve done everything else, and I’m right back to where I started. I roll joints and smoke them. I make my own edibles, too, mostly because I don’t believe what edible companies say they put in them. I’ve had a couple of experiences with stuff that was just supposed to be [non-psychoactive] CBD that got me stoned. One time I was on stage at a book event when I realized I was suddenly getting very, very stoned. That must have been humbling. What do you think are good cannabis-related investments right now? Selling shovels. It’s like the gold rush, all the peripheral stuff is lucrative. Do you think big companies are going to take over today’s market? Eventually the big companies will start to absorb the smaller companies, because they can afford to lose money, where the small growers can’t. In terms of product, I think it’ll be like beer, where there’s a lot of beer that’s cheap because huge companies make it, and then you have your small-batch, craft varieties. And, of course, people will always be able to grow great pot themselves; it’s really very easy. What about Jeff Sessions? Do you think he’s going to be able to thwart the growth of this industry? If the federal government starts all that, they’re in trouble, not the industry. They don’t realize how powerful and widespread the industry already is. Do you think states like Colorado and Washington are suddenly going to say, “Nah, we don’t need all that tax money.” If this administration thinks they’ve seen resistance already, wait until they try to take away people’s pot, which is many people’s medicine. Throughout your decades of growing weed and being involved in pot culture, have you considered yourself an activist in regards to marijuana prohibition? My thinking was, Hey, if I get the seeds out, there’s no putting genie back in the bottle. In other words, these great seeds are for growing great marijuana, and they’re going to be distributed all over the country. I distributed them in the East, and I distributed them in the West just by giving them to growers. I figured they’ll be there forever, and nobody can do anything about it. That was my way of subverting the possibility of a takeover by the big companies. But with Reagan in 1980, there was a major change. Not to mention, [New York Gov. Nelson] Rockefeller was instituting these draconian laws of determinate sentences and everything else — you get 20 years for this, and 30 years for that — and suddenly, it was very different. Then there was Operation Green Merchant, which was absolutely ridiculous. It gave free hand to the DEA or the cops to take all your stuff, even without charging you. The amount of money and property they took was ridiculous. That can still happen today, too — even in places like California. I advise a group where the CEO was raided on a fluke a few years ago while growing a small amount for a co-op. It was completely legal under California law, but they took all his plants and computers. Everything. Four years later, he gets his stuff back, and it’s totally worthless. The information is gone; the pot is gone. Were you worried about being targeted by Reagan or the government at any point? The thing is, we were all criminals. But we were the good guys. There’s a big difference there, you know? We didn’t feel like bank robbers. We knew the government was lying about everything, and we knew marijuana had tremendous potential. I’ve also written two brief histories of hemp, which was a huge industry throughout history. In 1936, there was like 50,000 tons of hemp oil produced [in the U.S.]. Between 1935 and 1936, hemp was being used for everything you can think of, especially lamps, cosmetics, paint and varnishes. Long before that, the world basically sailed around the globe on hemp, making clothing, sails and cordage out of it. I know a guy in Amsterdam who 15 years ago said that he was going to see that hemp was in every car made in Europe and now it is. Hemp is used for insulation and other parts, replacing plastics. He’s the largest hemp grower in the world today. I believe in using real materials that degrade and renew rather than all the crap we’re shoveling into the world, you know? Do you think your writing helped protect you from law enforcement, too — that it made you more legitimate? Because I made my money writing, I avoided being trapped. There was a guy who kept trying to create a business relationship with me, talking about how much money we would make together if I took him around to all these growers, and I’m sure he was DEA. He persisted for months even though I told him I wasn’t interested from the very beginning. At one point, a group of us were on the phone, including my publisher, talking about how it seemed like they were going to come after us, and we thought about how we’d try to get the book publishing business to protect us. We talked about how we would go to Publishers Weekly and all these different book organizations and ask them for their help and support. But I was definitely foolish. Some of the things I did, people say, “Wow, you have really big balls.” When I think back, though, I’d say I was a little younger and a lot more foolish. There were things that happened, like a fire at our place in Oakland. All the neighbors were out in the streets like, “Wow, you’re growing so much pot back there!” I kept waiting for the cops to come arrest me, but they didn’t. The fireman just took the pot that they helped us save, divided it amongst themselves and never told the cops a thing.